Enter Lesley Balla’s (@lesleyLA) tweet, one that recalled a post she made on Zagat back in February on O Banh Mi in Silver Lake. As I often do to write, I had already planned to head to Silver Lake. Perfect. After scrambling out of my workout clothes, I drove up Hyperion. I parked on a side street as the house numbers approached the right one and set out on foot…only to walk right past the foliage ensconced O Banh Mi. But who could blame me? This daily, lunch-only spot serves up some pretty tasty Banh Mi for $7.50 per sandwich – a price you wouldn’t compare with those sold in Westminster or San Gabriel Valley, but should consider a steal for such a quality product right in Silver Lake. Thin, crispy French baguette framework, check. Signature veggie-meat combinations, check. Prime meat-to-vegetable-to-bread ratio, check. Accepts only cash for O.G. Asian hole-in-the-wall status, check. Got an afternoon when you’ll be in Silver Lake? 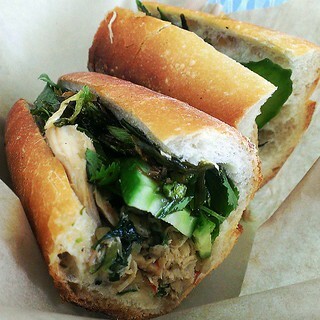 O Banh Mi is the place to be – if you can manage to find it. 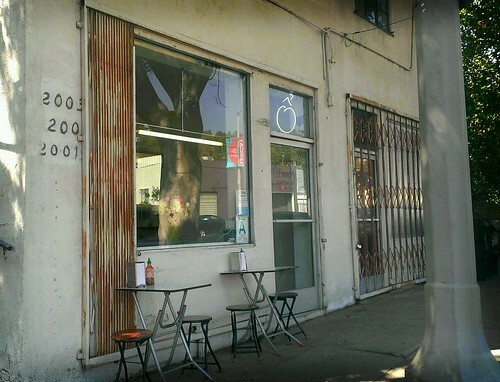 This entry was posted in Food, lunch, Silver Lake and tagged baguette, Banh mi, cash, daily, Hyperion Avenue, lunch, Ô Banh Mi, sandwich, Silver Lake, Vietnamese. Bookmark the permalink.